Swiss-born, Berlin-based trombonist Samuel Blaser is a musician to watch. He has a unique and personal vision, imaginative scope of articulation, and an ability to communicate and surprise with his sonic discoveries and ideas. This excellent new recording, his best so far, impresses more with every listening. 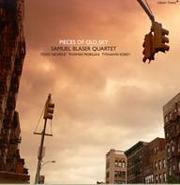 The album was recorded in New York with three forward-thinking collaborators—guitarist Todd Neufeld, bassist Thomas Morgan and drummer Tyshawn Sorey, the same trio that collaborated on Sorey’s recent masterful Koan (482 Music, 2009). Blaser’s original compositions are arranged as a suite that moves between delicate, soft declarations and forceful, energetic outbursts. The title piece sounds like an extension of the sessions of Koan. This 17-minute opus has the same spiritual quality, where open-ended, ethereal improvisation with nuanced and fragmented abstraction has an intense power and magical beauty. The spare and introspective interplay sounds thoughtful but at the same time has a haunting, emotional intimacy. Two short selections, “Choral I” and “Choral II,” that punctuate the more energetic pieces, continue in the same vein, as afterthoughts of the title piece. Other pieces feature evolutionary progressions of the compositional innovations of Charles Mingus and sometimes Thelonious Monk, especially on the playful “Red Hook,” with Morgan’s fat- sounding bass, in the way that all the players bounce back and forth pieces of the theme as they push each other forward. “Mandala” is a remarkable tour de force of Blaser’s abilities as a leader and soloist. He is a master instrumentalist who has an idiosyncratic voice, assured and strong, aware of the tradition of his instrument but determined to advance with his own sound, with great finesse and rich, nuanced phrasing, an impeccable ear for harmony, and tons of imagination. This quartet has created its own fascinating sonic universe on their first recording as a quartet; an admirable achievement.